Are you keen to build a more connected neighbourhood where you live? 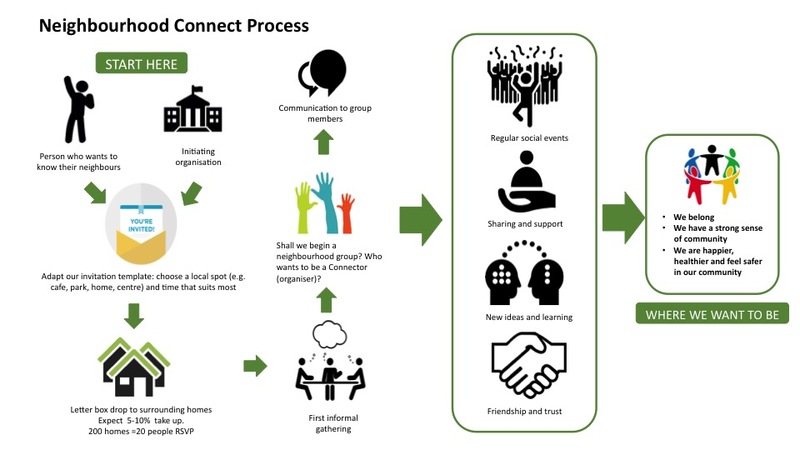 The Neighbourhood Connect project team is here to help support you to connect with your neighbours by providing free resources – ideas, examples, tools, encouragement and support, via this site and over the phone. What happens when neighbours connect? As neighbours get to know one another through simple, regular social gatherings, they find common interests and concerns. People help one another, friendships may form, kids find playmates, matters affecting the area are shared and the group may take on projects of interest to members. We use a community development approach, where we give lots of ideas and encourage each neighbour group to choose for themselves what they want to do. We call the people who initiate and take organising roles Community Connectors. Anyone with an interest in turning their streets into a community can do this. While one person may initiate, we encourage that person to find two or three neighbours to share the connecting role if your group decides to have further gatherings. What do Community Connectors do? Decide on what area around your neighbourhood you will include -for example how many streets would you include in an invitation drop? Ideally between 200-400 house is a good number (expect around 5%-10% take up). Choose a date and time for your event. Think about who lives in your neighbourhood…families, singles, couples, older people/or young people? What time of day would be suitable getting the most people to join in? A weekend afternoon or morning might be most suitable for the first event to ensure those working during the week can attend. Consider the weather, time of year, avoiding holidays times when people may be away. Pick a venue. This may be at a café, park, your front yard or other local venue. Choose an invitation template or design your own, complete your invitation and arrange printing. You may know people who can assist with printing to reduce any cost impacts. For example, sometimes local Real Estate agents or Politicians offices are happy to support local community causes. Food and drinks help to add atmosphere and your favourite sausage roll recipe can make a great conversation starter! Make sure you include those details on the invitation so people know what to expect. The easiest thing is to ask people to bring their own drinks and a small plate of food to share if you are meeting in a park or casual location. Do a letter drop box of the invitations to your local area and get ready to welcome the neighbours to your event! Most of the time people are keen to connect further and that’s the beginning of a Neighbours Group. We give you advice about having a small team of Connectors and ways to communicate and give invitations to further gatherings.